A good start to the day. Coffee at Vagabond. 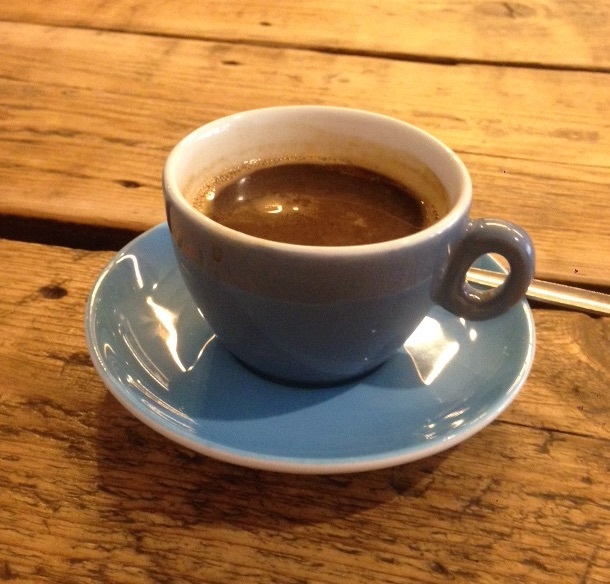 A long black, flat white (with soya milk) and a tea. Yes, you could say we spent a fair while at Vagabond in Highbury the other week. It was a lovely space to catch up with an old friend again. There were plenty of comfortable seats and the staff were definitely friendly, supplying us with coffee and space to chat for a while. The coffee was good (Vagabond are roasters as well as a café) with batch brew and Aeropress/drip on offer together with the usual selection of coffees and other drinks. Tasting notes were on a black board behind the counter while on the wall, also behind the counter, was a drawing of a tongue taste map. While the science of this has been disputed, it does serve as a reminder for us to sit back and properly appreciate – and taste – what we are drinking. Above the espresso machine was a long rectangular sign that said “coffee in progress”, suspended by four cables, one at each corner. 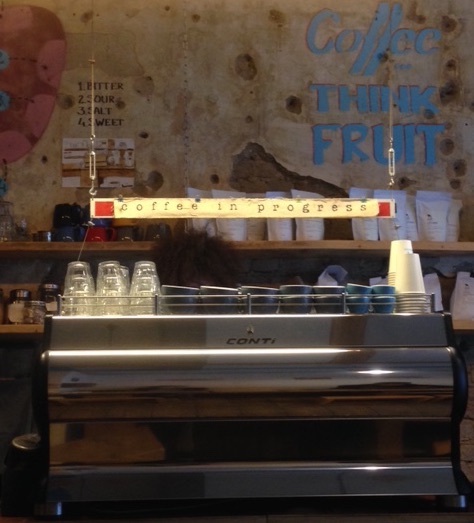 Coffee orders were placed onto this sign allowing the baristas to keep track of who ordered which drink. Given how busy this café occasionally got (and we weren’t even there for lunch), it seems that this is a very handy system. Each time an order was placed on the sign, the whole sign oscillated, rather like a rigid trampoline. Even if you had not seen the note placed on the sign by the barista, you would get a clue, a piece of evidence, that something had just happened by the vibrations long afterwards. Perhaps you may say that the sign was some sort of “order-detector”. Or at least, that is what you may say if you were thinking about the LIGO (Laser Interferometer Gravitational waves Observatory) detectors that, back in 2015, detected the gravitational waves produced by two merging black holes between 700 million and 1.6 billion light years away. Not only do these detectors have similarities to the order-detector sign at Vagabond, the beauty of the LIGO detector is that you can start to understand how it works by staring into your coffee. 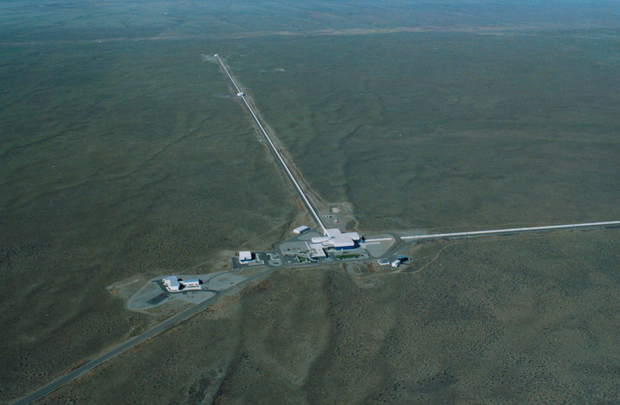 The LIGO experiment consists of two detectors. Each LIGO detector is an L shaped vacuum tube (4km long) with a mirror at each ‘end’. A laser beam is split between the two legs and reflected back by mirrors at the end of each L. When the reflected laser beams return back to the detector at the corner of the ‘L’, how they interact with each other is dependent on the exact distance that each laser beam has travelled between the mirror and the detector. Think about the bubbles on the surface of your coffee. These colourful bubbles appear as different colours depending on the thickness of the bubble ‘skin’. You may remember being taught that, exactly as with oil slicks on water, it was about the constructive and destructive interference of the light waves. As each ‘colour’ has a different wavelength, the colours that destructively interfere change with the thickness of the bubble skin. You can determine the thickness of the bubble by the colour it appears. In the LIGO experiment, there is only one wavelength because the light is coming from a laser. So whether the detector registers an intense laser beam or the absence of one, depends on whether those two beams coming back from the mirrors interfere constructively, or destructively. (A deeper description of the technique of “interferometry” can be found here). As the gravitational waves emanating from the collision of the black holes encountered the mirrors at the ends of the L’s in LIGO, so each mirror wobbled a little. This small wobble was enough to change the intensity of the laser light received by the detector and so reveal that the mirrors had moved just that little bit. In fact, the detectors are so sensitive that they can detect if the mirrors move by less than the diameter of a single proton. Given that this is a sub-atomic distance, I don’t think I can even start to relate it to the size of an espresso grind, even a Turkish coffee grind is millions (billions) of times larger than the amount that these mirrors moved. Yet this is what was detected a couple of years ago in the now famous announcement that gravitational waves had been detected and that Einstein’s predictions had been shown to be true. Watching the “coffee in progress” sign oscillate at Vagabond, it is clear how much engineering has gone into isolating the mirrors at LIGO enough that they do not move as people walk by. Yet perhaps it is interesting that, nonetheless, one of the final refinements of isolating the mirrors from the vibrations of the earth involved changing the material for the cables that suspended them, just as with the sign at Vagabond. You can learn more about the engineering behind this incredible feat of detection in the video here, or you can go to Vagabond, enjoy a lovely coffee and think about the physics of detection there. If you would like to hear what the collision sounded like, follow the link here.